Paddle boarding at night is quite dangerous. Because of the reduced vision, the conditions of the ocean are worsened much further. Besides, the ocean is likely to have a scarcity of humanity in the darkness of the night. Still, people have found it fun and productive to paddle board at late hours. Fish are usually easier to attract at night, and there is less competition from other fishermen at such times. There are several safety measures you can take to make your night paddle boarding experience safer and more interesting. Most importantly, you should take advantage of paddle board LED lights. So what exactly are these lights? 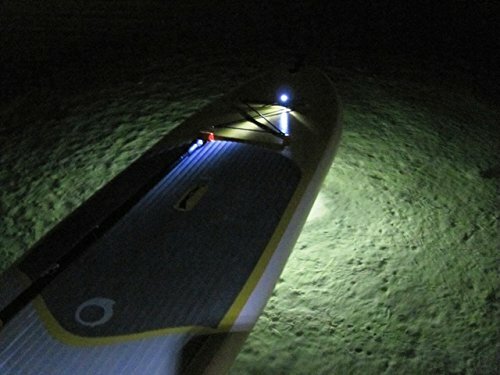 What are Paddle Board LED Lights? These products are meant to improve your vision at night and attract fish to your bait. Carrying flashlights is much less effective and even inconvenient. These lights are usually attached to the paddle board or other gear. Sometimes, they are attached to the lower surface of the boards, and this is meant to light up the water. Part of the fun of paddling at night is watching the water and the wide variety of aqua wildlife clearly. You can’t get such scenes in broad day light. When attached to the paddle or the board, the lights are also very effective in attracting fish to your bait. This can considerably increase your productivity, especially since there are very few people who fish in the night. 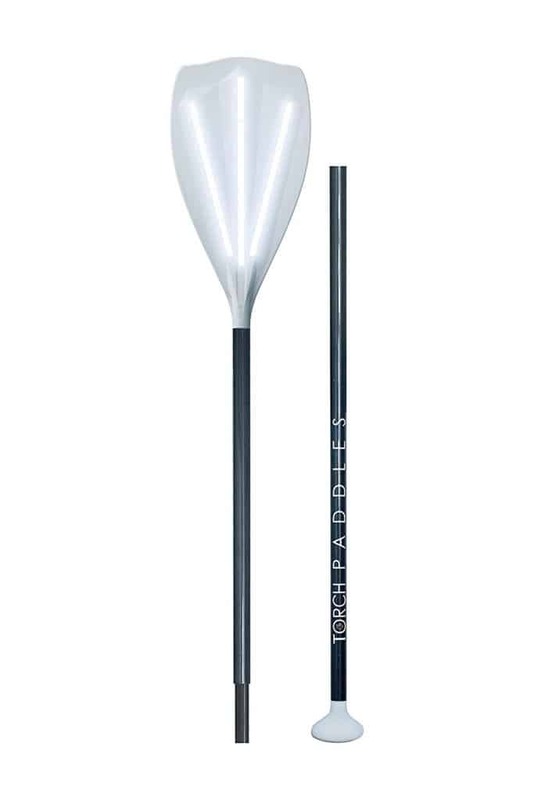 The lights can be strapped to both ends of the paddle or a single end, depending on your preference. Some people find the LED light paddles heavier, but they can actually help you stay safe and catch more fish. Paddle boards are made different by varying manufacturing companies. Some include an emergency feature that makes the lights flicker to signal that you need help. This feature will come in handy, considering the danger you will be exposed to in the ocean. Ideally, you should also bring a friend or more when paddle boarding at night. In many cases, you might have the entire ocean to yourself. Having a friend in the proximity will make the flashing LED light signal useful. 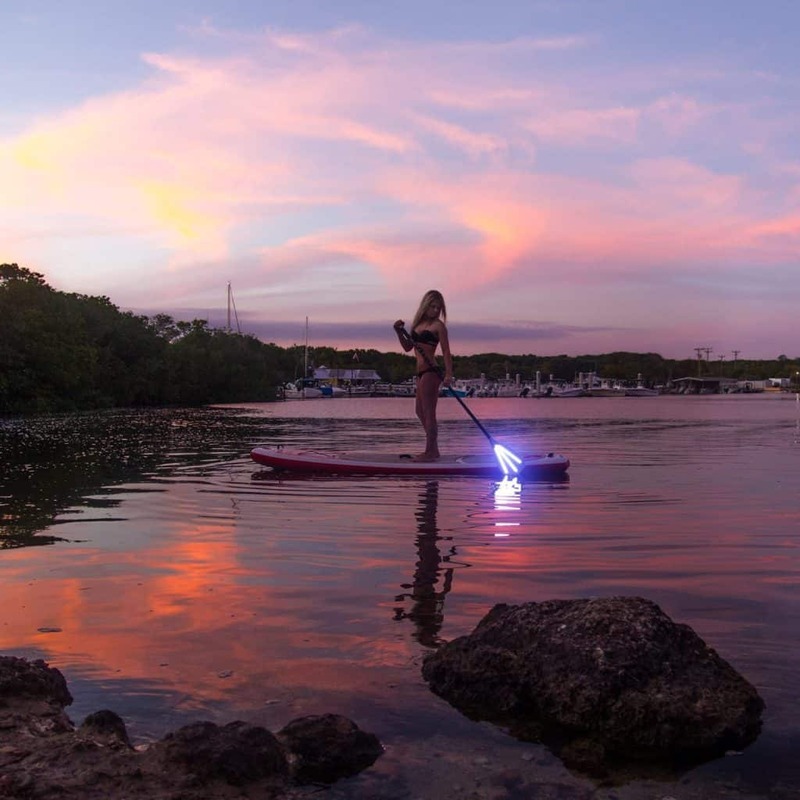 Paddle board LED lights are designed to light brightly so that you can see further into the water, and also to allow people to see you. They can be seen from a mile away. Usually, they have over 200 hours, so they can last you the entire season. 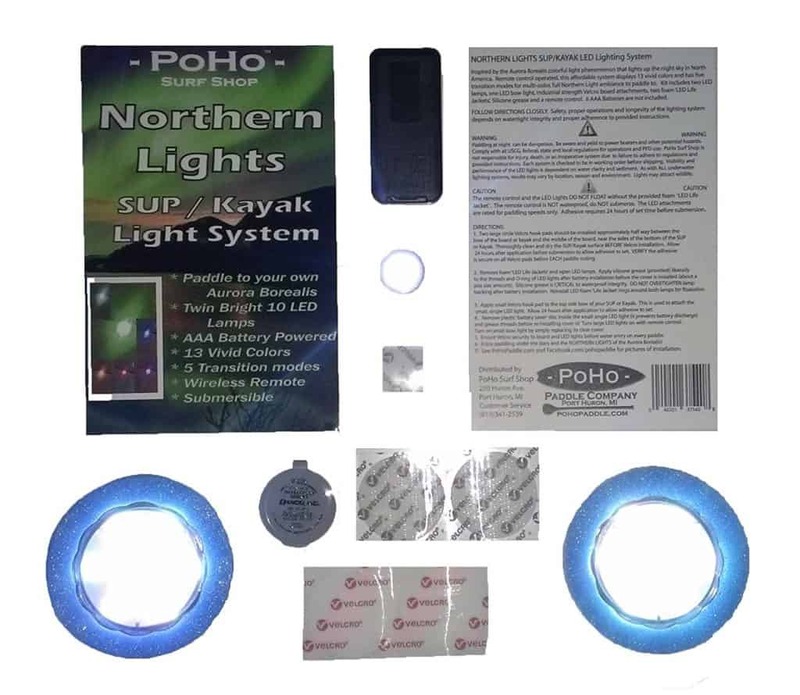 Since the intention is for the lights to be used in or around water, they are made to be shock and water proof. These LED’s will also work just as well on any Pedal Board you may own which is really no different from a paddle board other than the drive feature and size. 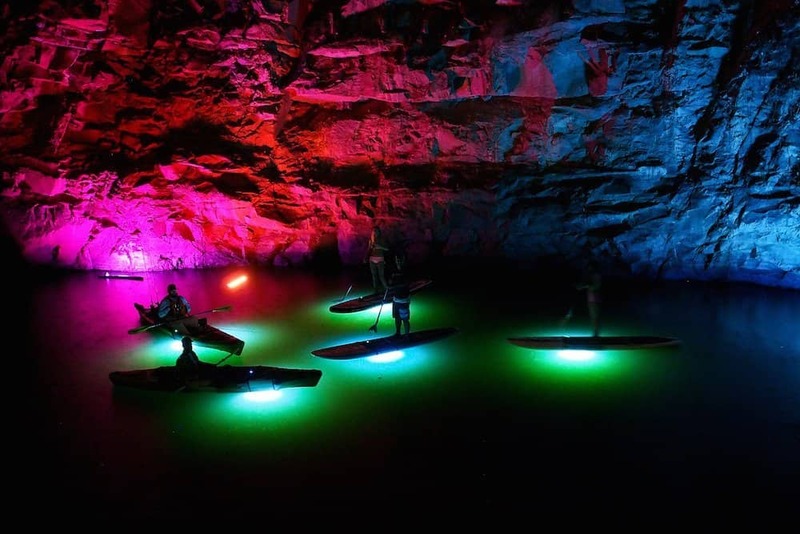 This is the best-known and most popular paddle board LED light on the market. It offers more than 2,000 lumens of power. The lights can run for 3 hours on a single charge; then, will have to be recharged for extra time of fruitful fishing. It takes 3 to 4 hours for the battery to charge fully. You can tell when charging is complete by watching the LED light on the charged block. It will turn green when the charging process is complete. 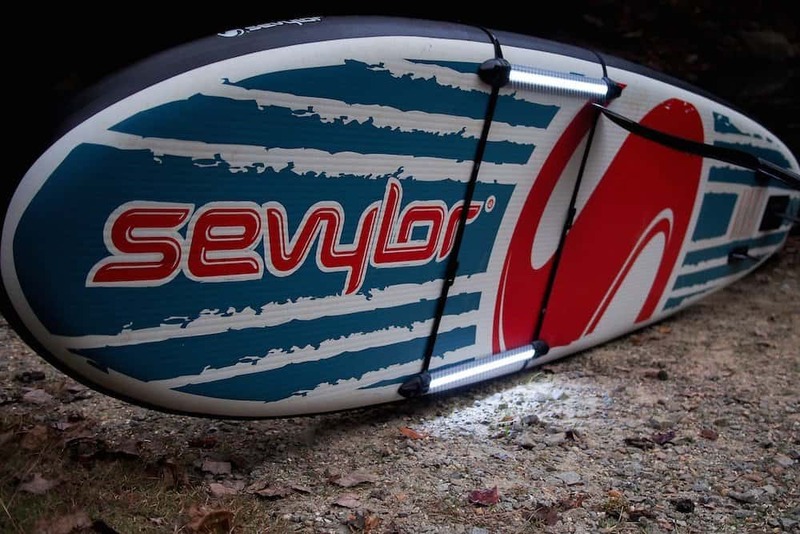 The lights are removable and can fit in a wide range of paddle board sizes. They simply need to be strapped to the board when fully charged. The straps are designed to be adjustable, and this is why the lights can be used in different sizes of paddle boards. 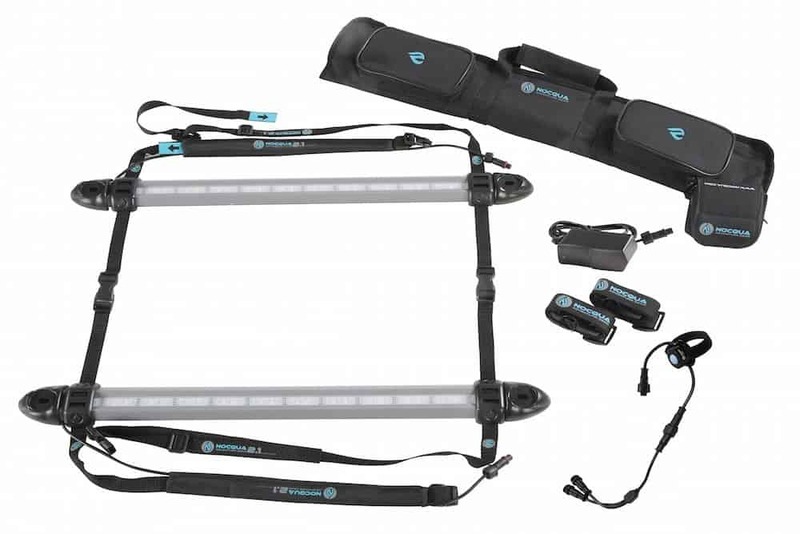 The light kit comes with a travel case that can be used to transport the product to and from the beach. These multicolored lights are meant to be strapped to the bottom of your board. They can be used on almost all stand up paddle boards since they are attached using Velcro. You should clean up the bottom of your board before attaching the lights to ensure greater security. The adhesive may fail to stick if you don’t prepare the surface. To prevent sinking, the lights have a life jacket. They have 13 colors and five multicolor transition modes. The system comes with a remote control to change the lights as you see fit. You can also alter the speed of transition using the remote control. The lights run on six AAA batteries, and these are not included in the original package. 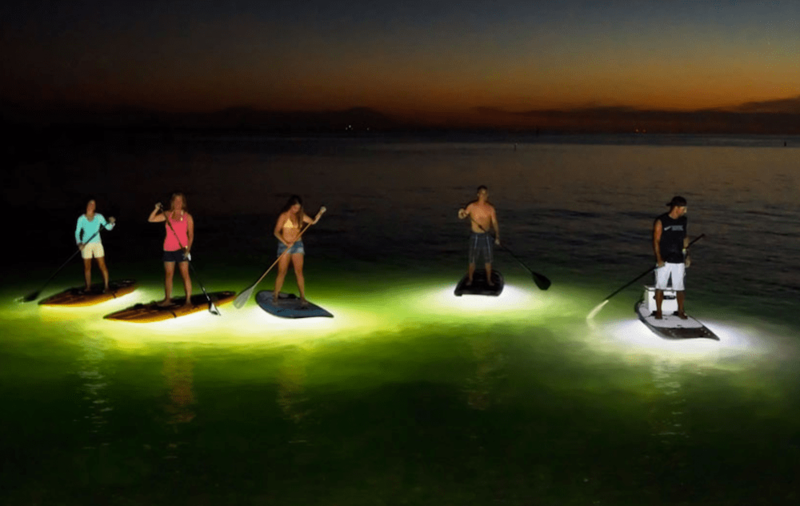 The batteries on this paddleboard light system provide 40 hours of well-lit surfing. Once this period is over, you will need to recharge the batteries. These lights run on 8 AAA batteries and can light up a distance of 10 meters below the water. Above the water, it can light up to 45 meters. It is made of lightweight aluminum to reduce the drag. Although the lights can be used on many different paddle boards, it is advisable to strap them to soft top paddle boards since these offer more traction and have a more forgiving design. Thanks for reading. Be sure to read our other paddle board reviews as well. Please let us know in the comments below other reviews you would like to see or thoughts you may have. Previous Post: « What Is A Soft Top Paddle Board?